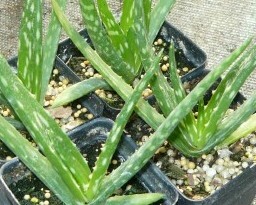 Aloe Vera - Leaf gel applied topically to skin helps to soothe minor burns including sunburn. Tropical succulent plant must be overwintered indoors in cold climates. Cannot be shipped to cold locations during winter months. Perennial zones 11+ Live starter plant in 3 inch container.